How to shape your higher ed marketing department for greater success. Here's what the marketing department should look like on your campus. Here’s what the marketing department on your campus should look like. 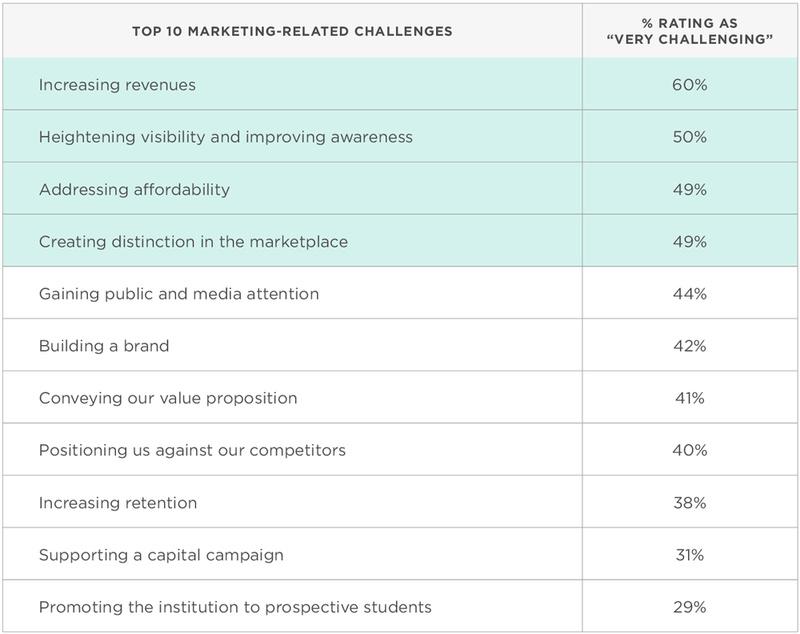 Our research found that “heightening visibility and promoting awareness” and “creating distinction in the marketplace” ranked second and fourth respectively among the top ten marketing-related challenges identified by presidents. In terms of marketing priorities, presidents reported that “product” was their highest priority among the five Ps of marketing. Indeed, 70% of presidents indicated that they added distinctive academic programs in the past five years. However, only half conducted feasibility studies prior to their launch. No surprise then that less than half were able to report “very successful” increases in enrollment and revenue due to the launch of these programs. When it came to the influence on shaping new product and experience development, less than half of the presidents indicated that marketing played a role. 49% of the presidents in the survey stated marketers had influence on non-academic experience development; only 42% carried any influence in developing new academic experiences. This information highlights an important disconnect that needs to be addressed; namely that a gap exists between the empowerment of marketing to shape program development and the importance that presidents give to building awareness and distinction in the market.